Starring: Kyle Chandler, Elle Fanning, Joel Courtney, Gabriel Basso, Noah Emmerich, Ron Eldard, Riley Griffiths, Ryan Lee, Zach Mills, Dan Castellaneta, Glynn Turman, Michael Hitchcock, A. J. Michalka, Jessica Tuck. Steven Spielberg serves as producer on this latest film from director J.J. Abrams, and if you hadn’t seen the credits or been told beforehand, you might well think he’d done more than produce. This is Abrams unashamedly emulating the great master. Sneaking out at night with their Super-8 camera, to shoot a pivotal scene in their homemade zombie film, Joe (Joel Courteney) and his pals witness a dramatic train crash. After the mililtary move in to clean things up and some people begin to go missing, the boys realise that some form of creature escaped from the wreckage. 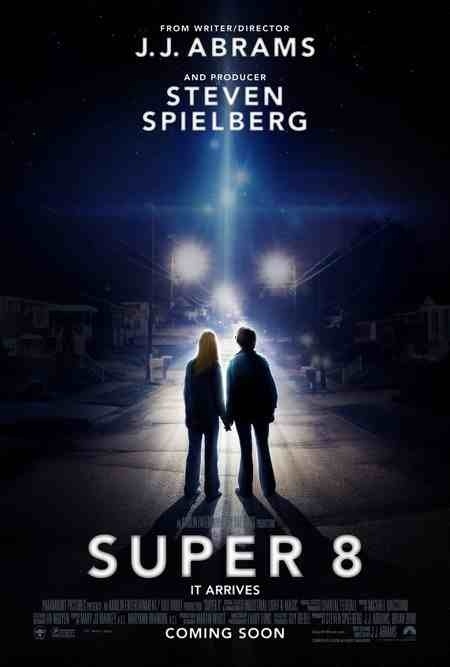 As several, if not all, of critics will have mentioned, this is reminicent of Spielberg’s earlier works. It has the same small town setting and wonder of “E.T.”, the same sci-fi influence of “Close Encounters…” and the same camaraderie of his earlier production of “The Goonies”. It’s 1970’s America is before the days of video games, were the kids still went out on their bikes and a ‘Walkman’ was a prized possession. Everything is captured in true Spielbergian style and Abrams’ attention to detail is flawless. So much so, that a young audience today may not identify with it, due to it’s old fashioned nature. I however, found it to be very refreshing indeed. They just don’t make films with as much heart as this anymore. It’s slow in the build up, with Abrams in no rush to reveal. He gives his cast of young talented unknowns a lot of room to manouevre and the familiarity between them is entirely believable. There’s so much going on with the strong characters that having the creature absent for most of the film and lurking in the background is entirely acceptable. It’s an old fashioned monster story (complete with miltary cover-up) that relies on the ability of it’s cast and doesn’t feel the need to go over the top with CGI. When it does reveal what’s lurking around the town, that’s actually when the film falters. Having it unknown for most of the film was part of the appeal but this is a small gripe in what’s a fresh contemporary movie. Abrams has been a director that has given a much needed adrenaline shot to recent film franchises “Star Trek” and “Mission: Impossible III”, and this ability to inject some vitality into an old format doesn’t look like subsiding any time soon, if this latest delivery is anything to go by. This entry was posted on February 2, 2012 at 12:40 pm and is filed under Mystery, Science Fiction with tags 2011. You can follow any responses to this entry through the RSS 2.0 feed. You can leave a response, or trackback from your own site.